We are pleased to announce that a digital archive presenting materials by and about J. Ridley Stroop is now available. J. Ridley Stroop, ca. 1936. This photo was taken around the time his dissertation was published in The Journal of American Psychology. 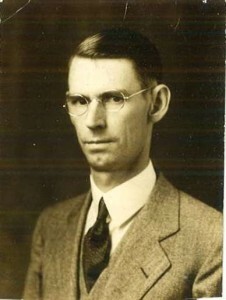 Photograph, John Ridley Stroop Collection, Milliken Special Collections, Abilene Christian university, Abilene, TX. When you begin a project in Special Collections, you never know where it might lead. As Bilbo puts it, “You step out onto the road, and if you don’t keep your feet, there’s no knowing where you might be swept off to.” So, expectations and reality don’t quite align; you end up in places you don’t expect. Such was the case with the J. Ridley Stroop Collection. This collection not only offers a window into Stroop’s life, but also presents ties to the founding of two major Christian universities – Abilene Christian University (Abilene, TX) and Lipscomb University (Nashville, TN). It also contains personal artifacts from the creator of one of the most widely used and cited research studies in the field of psychology. Dr. Stroop’s wife, Zelma, was the great-niece of David and Margaret Lipscomb. David Lipscomb founded the Nashville Bible School, which evolved into Lipscomb University. Margaret’s family, the Zellners, share a significant part in the founding and early development of Childers’ Classical Institute, now Abilene Christian University. —About John Ridley Stroop provides a basic biographical and professional precis for his life and work. –The Lipscomb Family section highlights one-of-a-kind artifacts from Zelma’s family, particularly her father’s diploma from Nashville Bible School and Margaret Ophelia Zellner Lipscomb’s 1859 diploma from the Columbia [TN} Athenaeum. Finally, we include a bibliography of John Ridley Stroop’s published books and other resources for further study. Feel free to comment, ask questions or share memories of the Stroop and Zellner families.